Want professional feedback on your song? With membership, you receive (1) Online Song Feedback opportunity during your membership year. 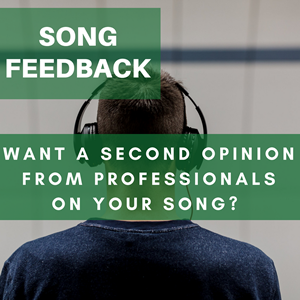 Through our Online Song Feedback service, you will receive video feedback from professional songwriters or industry representatives from the comfort of your own home. Use this service to get your songs industry ready! STEP 1 - Register one song (.mp3 & lyrics) for an Online Feedback Session prior to the event. Registration fills up quickly, so submit as soon as possible! STEP 2 - The industry guest listens through the first chorus of each song, and makes suggestions on where they think the song can use improvement. There is no audience or attendance for this; we video record the guest giving feedback. STEP 3 - On the event date, you will receive an email with a video link of the Online Feedback Session for you to watch at your convenience. It is encouraged to watch everyone else's critique to learn from those songs as well! **You are in no way giving away rights or ownership of your song through this service. **This is not an 'in person' or 'live streamed' event. Questions about Online Song Feedback? Email Erin at erin@nashvillesongwriters.com. For submitting your song to online pitch event, you must be logged as a member.